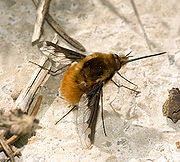 Bombylius major, also known as the Greater Bee Fly, Dark-edged Bee Fly, or the Major Bee Fly, are the largest and most common species of Bombyliidae found. As bee-mimics they not only mimic bees in appearance but in behavior as well. Its long proboscis is used to feed on nectar from herbaceous plants. Bombylius major, in the family Bombylidae is one of two species that are large bee-flies. The other being the very rare Dotted Bee-fly (Bombylius discolor). 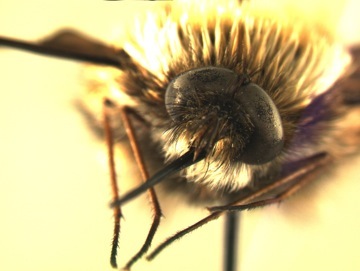 In their family Bombyliidae there are over 4,500 known species and thousands still unidentified. Bombylius major will usually be found between March and June, ranging from the United States and Canada to most parts of Eurasia. They prefer sunny patches near edges of woodland, roadsides, fields and gardens. The Greater Bee Flies body length ranges from 12-19 mm. Bearing an extremely strong resemblance to bees their body is stout and furry, with the top of the thorax being black and shiny and the pile either brown, yellow, or white. They have long spindly legs as well as a long rigid proboscis found in the front of the head. 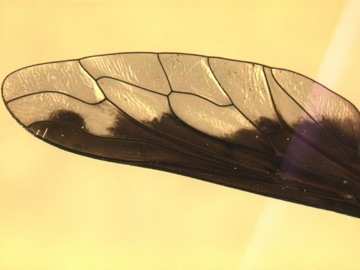 Their boldly patterned wings have a distinct dividing border through the horizontal middle between the dark and clear portions. Their antennae are typically very short and pointed. In the field they will be seen hovering and darting above bare ground or flowers, in an up-and-down movement, accompanied by a high-pitched buzz. Bombylius major mimic bees to allow them to get close to the bees burrow. When close, the female will flick the eggs into or near the nests of the host insects. The larvae are parasitoids which then feed on the food stored, as well as the young solitary bees or wasps. If the female is unable to flick their eggs near the nest they’ll plant them on flowers visited by the host insects. The developing larvae then make their way to the host nest or attach themselves to the bees or wasps to then be carried to the nest. Although the Greater Bee Fly is an excellent pollinator the larvae limit the population of other pollinators during their stages. "Bee Fly - Bombylius Major." North American Insects and Spiders. <http://www.cirrusimage.com/flies_bee_Bombylius_major.htm>. "Bee Fly - Bombylius Major, Species Information Page." Brickfields Country Park, Possibly the Smallest Country Park in the UK. <http://www.brickfieldspark.org/data/beeflybombyliusmajor.htm>. "BeeFly." Kendall Bioresearch Home Page. <http://www.kendall-bioresearch.co.uk/beefly.htm>. Borror, Donald Joyce, and Dwight Moore DeLong. An Introduction to the Study of Insects. New York: Holt, Rinehart and Winston, 1964. "Species Bombylius Major - Greater Bee Fly - BugGuide.Net." Welcome to BugGuide.Net! - BugGuide.Net. <http://bugguide.net/node/view/14997>. This page was last modified on 1 June 2010, at 11:52.